Hi folks. This is my first article for the Spaniel Journal and I wanted to start with something a little different from the normal aim of training articles. For this piece, we are going to assume (I know, don't say it) that your dog is well trained. So well trained, in fact, that you would like to try your hand at field trials. Maybe you have done trials before, maybe not. Following, are some tips that are meant to help you out when running your dog. It must be remembered that Field Trials are nothing more then a game that we play with our dogs. There are certain rules to this game, and many nuances that mean the difference between success and failure. As a beginner, you will make mistakes and you will not be able to remember everything that you are supposed to do. However, the more prepared you and your dog are before you get to the trial, the better off you will be. I'm hoping, also, that these tips will be used by Field Trial, as well as other judges, too. Remember, we can all learn something as none of us knows everything. "Most judges at a field trail are looking for the best dog, nothing more, nothing less." First off, let's go over some thoughts about judges - to get into their heads, so to speak. Often, the first point I hear new people bring up is the "politics" involved in judging. Poor decisions have been made at times in the past due to political reasons and I have been the victim of them before. That being said, the sport of Field Trialing Spaniels is remarkably politics free. I am continually amazed at how people who sometimes really don't like each other will ignore that to do what is right when judging. There are certainly issues with politics on the Bench side of things, and other breeds have much political hogwash in their competitions, but we are very fortunate to have a lot of honest people who try hard to be fair. It has been my observation that those who are most worried about political considerations are the ones who are the most political. Stay away from people who believe everyone is out to get them, remember that we do this for fun. Most judges at a field trail are looking for the best dog, nothing more, nothing less. Some of them have been running dogs and judging since before I was born. Some of them are just getting started. Field Trial judges in the U.S. now have to go through an apprentice program before their first judging assignment. They are then matched with an experienced judge at their first few trials. This system does not guarantee perfection in the judging ranks, but it does help give people a little bit of experience and guidance before they start. The important thing to remember is that everybody makes mistakes. Every judge has made some bad calls. Good judges will not make many and will try and reverse them - if there is time to do so. But the point is stuff happens and mistakes are made, deal with it and move on. What makes the best dog? Different judges look for different things. Some like speed. Some like big exciting things to happen. Some like an even flowing pattern. Some like little animated dogs, some like big, long striding dogs. No matter how good your dog is, not all judges will like it. However, there are some things that most judges do like and some things that most judges do not like. In the do-like column, strong bird finding is the key to everything. 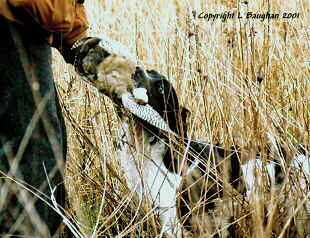 Many judges will forget a lot of bad things your dog did if it can find birds very positively. By that, I mean the instant your dog smells a bird, which should be from a fair distance away, it speeds up trying to get to the bird as fast as possible. A positive find is much more important then a positive flush. Very few people care if your dog jumps up after the flushing bird. I have seen many dogs that have stopped to look and listen then have broken the point to jump after the bird is flushed. That won't get you anywhere. What will get you somewhere is a dog that races as fast as it can to the bird to flush or catch it. If the bird flushes and your dog sits down without a four foot leap into the air, no one will notice if their hearts are in their thoughts because of the speed of the find that was just displayed. Also, in the do-like column is pattern. By this, I mean how your dog uses the wind to cover the course. Simply running from gun to gun doesn't always work well. As often as possible, your dog should be running perpendicular to the wind - and always smelling fresh ground. Your dog should always be turning out at the edge of each cast, even in the downwind. Turning in only insures recovering ground that should already be covered. This is a simple paragraph that I'm sure will turn into several columns worth of information as it is the most important aspect trialing. Why? In the previous paragraph we spoke of positive finds. Proper pattern will put your dog into position to have long, positive finds. 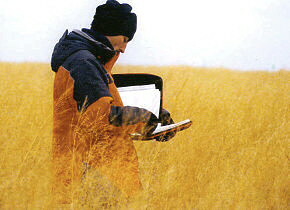 Long, positive finds will win you Field Trials. Simple as that. "But if you find yourself complaining that a judge isn't tapping you fast enough, that really means that your dog isn't steady enough." You can see that the do-like column is fairly short. It really only contains one point; which is fast hard finds and how to get that type of find. Most other things that judges like are not universal. Speed helps, but isn't everything. Style helps, but won't do you any good if you can't find birds. A dog that can mark birds well is a good thing to have, but that just keeps you out of trouble more then it catches a judge's eye. The do-not-like column is more encompassing. The theme of the do-not-like column is keeping your dog out of trouble. You want your dog to have a clean run with very few issues for a judge to ponder. We'll start the do-not-like column with mouth. Very few judges will tolerate many dead birds coming back to them. There will be trials when your dog will trap multiple birds. Your dog should be prepared to handle that, and should not injure the caught bird. Of course, there is always an occasional exception with a powerful flushing dog, sometimes a wing or a rib is broke. If that happens very often, then that is a hole that many judges will notice. From the same body region is tongue. Your dog should be quiet. We get away with a lot of noise here in the states, but it is generally not tolerated past a certain point by most judges. Your dog should not whimper or whine while waiting on an honor or to be cast off. (Not really interestingly, that is the most W's I've ever used in one sentence before.) Train your dog to be patient. Your dog should not bark at missed birds or yip when sent on a retrieve. Delivery is also important. You should not be wrestling with your dog to get the bird away from it. The dog should not be jumping up and grabbing the bird out of the judges hand. The dog should come in, give you the bird, and wait for the next command. Speed is important. Get the bird quickly and give it to the judge without making a big production of it. This is generally the last thing a judge sees before making their grade of your dog's performance. Leave the judge with a good feeling about your dog, not with a feeling of lack of control. Control is very important. Your dog should be able to run with only an occasional whistle. Whistling on each cast looks poor. Loud retriever whistles annoy many judges. Your dog should be able to be steady without a long, constant whistle blast. One or two reminder whistles is okay, if necessary. But if you find yourself complaining that a judge isn't tapping you fast enough, that really means that your dog isn't steady enough. "Quiet is better" is a good motto to have. How should you relate to the judge? I like to be cordial but not obnoxious. (We'll pause here while those who know me well pick themselves up off the floor.) Some judges are all business. Some like to talk way to much. If you are a new handler, identify yourself as such when you come to the line. Listen to the judge's instructions and then do your job - which is to show off your dog as much as possible while covering up your dogs shortcomings as much as possible. Judges do not like to be told how your dog is performing or what just happened in a given instance. Let them decide. It is better for you to be to quiet instead of talking to much. If you are unsure of what is happening in a given situation, ask, but don't argue. You will not get bonus points for arguing with a judge. Sometimes something very confusing happens and I just don't know what is happening. So I'll ask the judge what they would like me to do and then I'll try to do it. Otherwise, I'm focusing on showing off my dog. That leads us to the next point. Try to make a judge think as little as possible. The very best work your dog can do is to go out, find a couple of birds fast, flush and retrieve them, and then get out of there. You don't want a judge thinking too much about your series - trying to decide if it was good or bad. In the end, more often then not the dogs that didn't make them think, but instead just went out and did good are the ones who get the placements. Be polite to judges. It is okay for you to ask, after the placements, how your dog was judged. You must do so in an inquisitive manner. Let the judge know that you are just trying to learn more about how to properly run you dog. Ask for suggestions. And be short with it. Get some answers and then leave the judge alone - they most likely have a long trip ahead of them to get home and other people who want to talk to them. Most people are amazed, when they start competing with their dogs, at how many things can go wrong. What we do is very simple, but it is incredible how many ways dogs can find to mess things up. When that happens, take a deep breath, come back the next weekend, and show them how good your dog really is! I see that I possibly created a lot of questions with this article. Perhaps I raised more then I answered. What I would like you, the reader, to do is email the Spaniel Journal with those questions and we will go through the more popular ones in the next issue. Until then, good luck and don't forget the liver treats. Jason Givens experienced success in the Springer Field Trial game as an Amateur then turned professional nine years ago. He, and his wife, Michelle, own and operate Lighthouse Kennels at Cambria, Wisconsin. They train all flushing breeds for hunting and Hunt Tests, along with just Springers for Field Trials. To that end, since 2000, he regularly finishes in the top-ten for the Hogan Award - which is the top professional Springer handler trophy. Jason has several National Championship placements in American and Canada, including winning the American National Open in 2003. In additon, Jason has judged numerous trials in America and Canada, including the Cocker National and the Springer National Open.